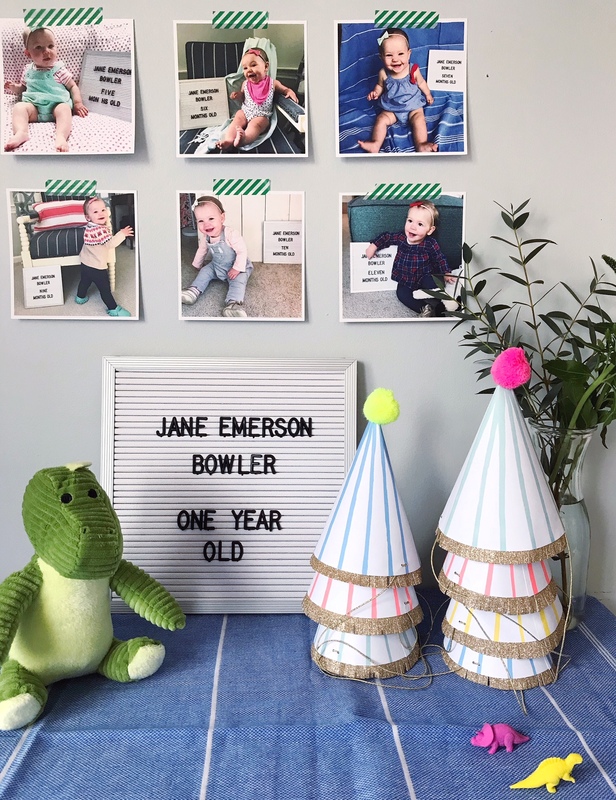 When I was still pregnant with Jane, my family was joking around and asking me if I had a theme for her first birthday party yet. Oh, they joked, but I honestly already had been thinking about how fun it would be to get to throw birthday parties for her. 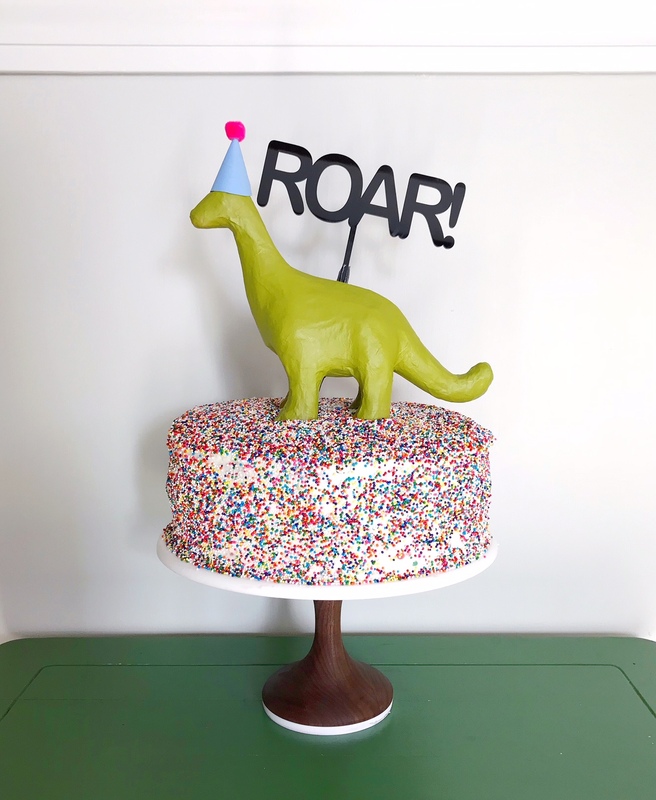 Over the last year, I tossed around idea after idea, and finally settled on a theme fit for our sassy, funny, little daughter who loved to say RAWR: dinosaurs. 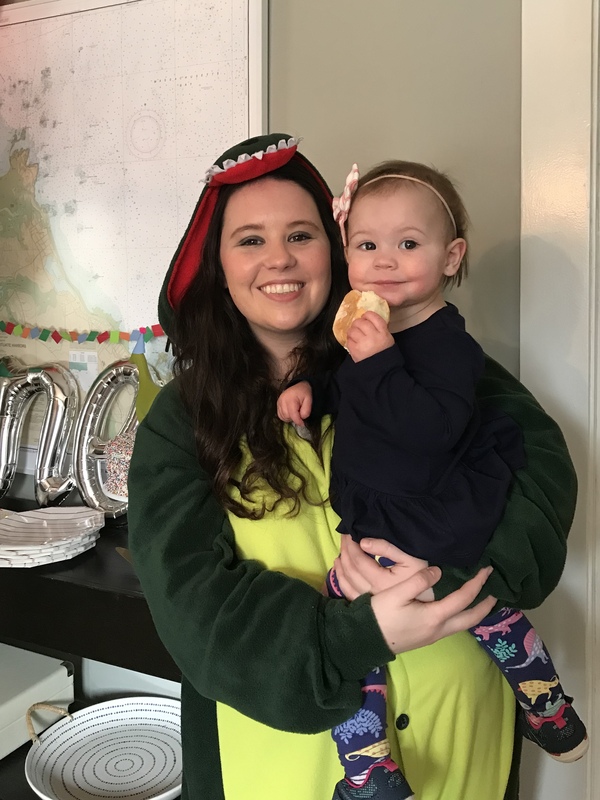 Jane loves books about dinosaurs, the toy dinosaurs at our local library are the first thing she crawls to when we visit, and she believes that all animals, no matter how big or small, say “roar” just like the dinosaurs. 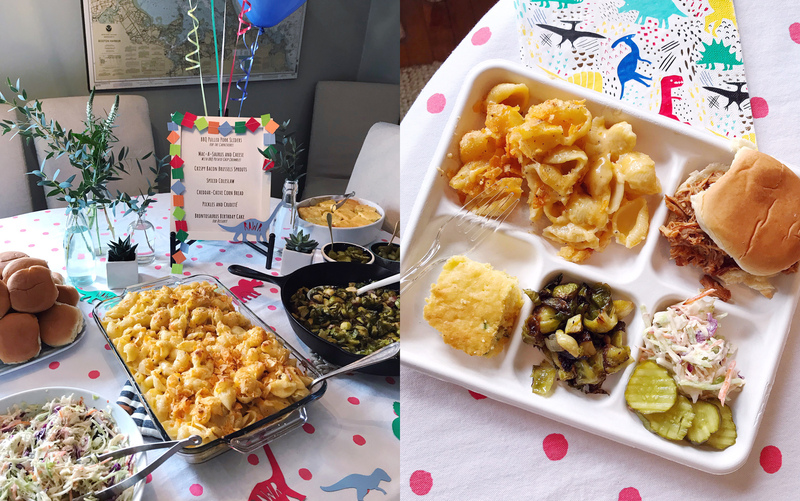 So a dinosaur themed party was an easy and obvious choice! 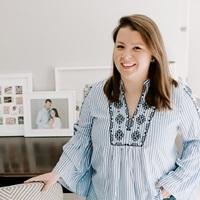 We had our immediate family come over for the celebration, and a few of our friends who have young kids around Jane’s age. It was pretty much the cutest thing ever to see her and her little buddies running around with party hats on (they were loving chasing the walking dinosaur balloon!). I DIY’ed a few simple dinosaur-themed decorations by using my Silhouette machine to cut out tiny paper dinosaurs for homemade garlands. 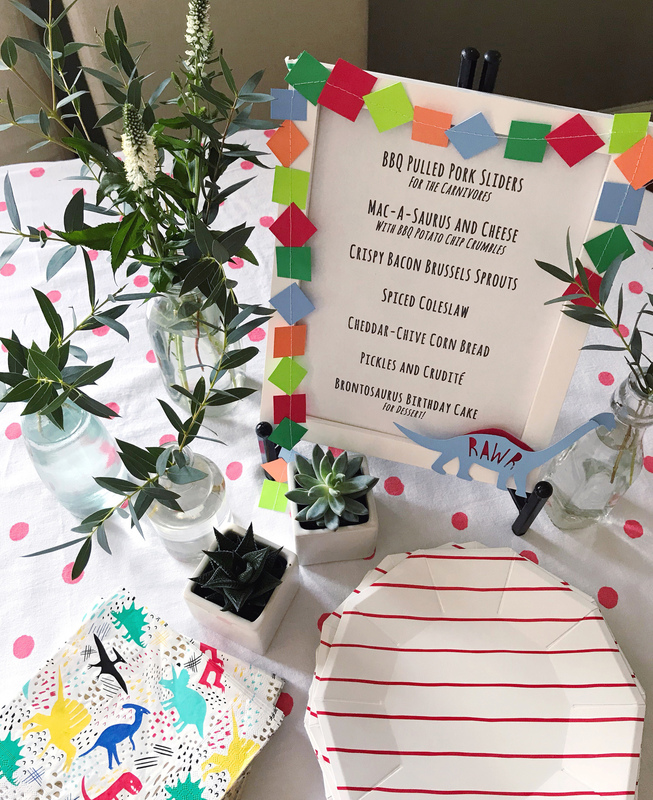 The garland color scheme was pulled from the most darling paper napkins with a modern dinosaur print on them. I made some extra garland and dinosaur cut-outs to decorate a menu for the lunch buffet, and used small glass vases with eucalyptus leaves in them to decorate the tables. The greenery was really simple, but had that wild-prehistoric look to it! 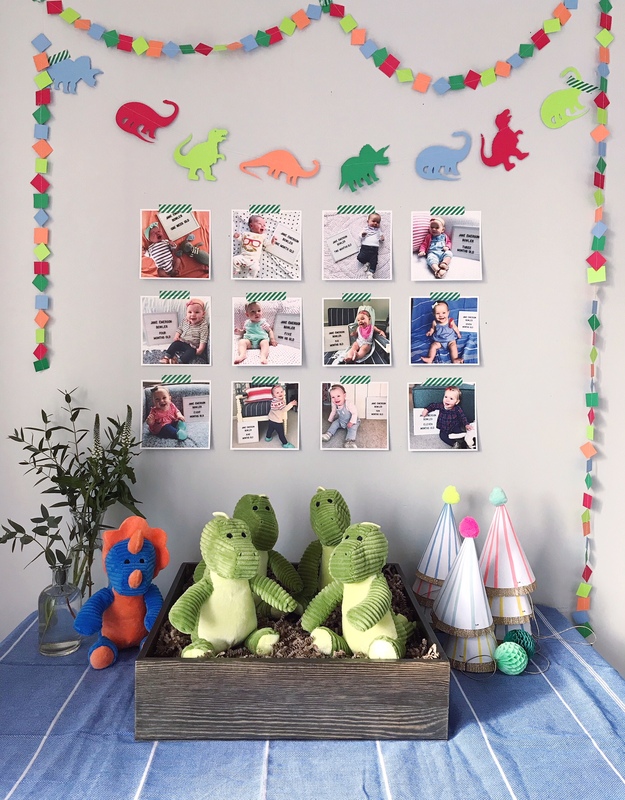 In Jane’s playroom, I set up a table with some stuffed dinosaur party favors so that her little buddies could adopt their very own dinosaur. I found the stuffed dinosaurs in the Target dollar-bin (and credit goes to my mom who went to 4 different Target stores to find them all, thanks mom!). Above the party favor table I made a little photo wall with all of the monthly photos I’ve taken of Jane. Those darn photos became so much work once she started to squirm and move, so I’m glad to have been able to display them and give them their moment to shine! For the menu, I went with a barbecue theme. We had pulled pork sliders (I used the Pioneer Woman’s recipe and converted it to cook in my InstantPot)and my homemade mac and cheese with crushed BBQ potato chips on top. On the side I made a skillet of roasted bacon brussels sprouts, a sriracha coleslaw, cheddar-chive cornbread, and put out a variety of pickles and cruditè. Of course, it’s not a birthday party without cake! 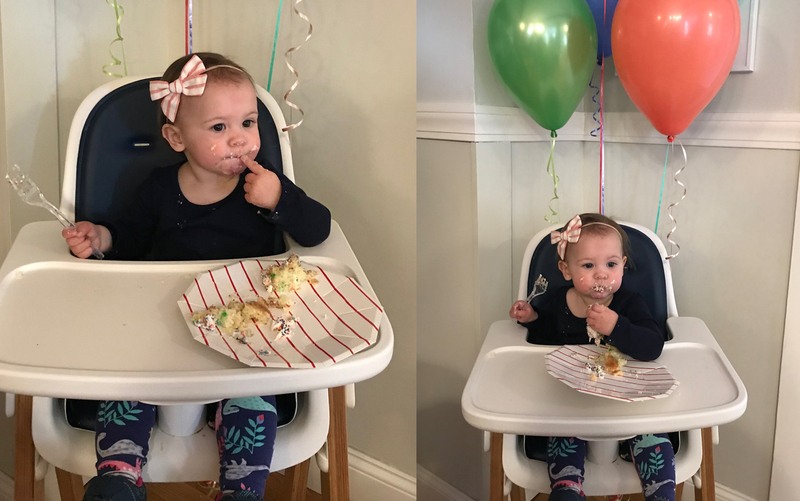 Funfetti is a tradition in our household, and was an absolute must-have for Jane’s first birthday. I made a double-batch so I could layer it high on my favorite AHeirloom cake stand, covered it in rainbow sprinkles, and then went over the top with cake toppers! I made a green party-hat adorned dinosaur and paired it with the modern ROAR! cake topper from Geese and Ganders. Jane loved it, and kept pointing to the dinosaur long after the cake cutting was over because she thought there might be some more icing she could lick off the bottom of the feet. Everyone got in on the fun. My hilarious sister bought a dinosaur costume and changed into it during the party. Both adults and children thought it was hilarious. My mom brought Jane some dinosaur leggings to wear for her birthday out. Even Jane’s beloved stuffed puppy that she brings everywhere was feeling the festivities and got a party hat! The highlight of the day was seeing her face light up when everyone sang happy birthday, she totally got that it was all for her, and it basically made my heart burst. She is so very lucky to have so many people who love her this much. And she’s also so very lucky we let her eat all that cake, but you only turn one once! Happy birthday Janie! Game Day Loaded Potato Skins Three Ways. Sausage and Cauliflower Stuffed Peppers. 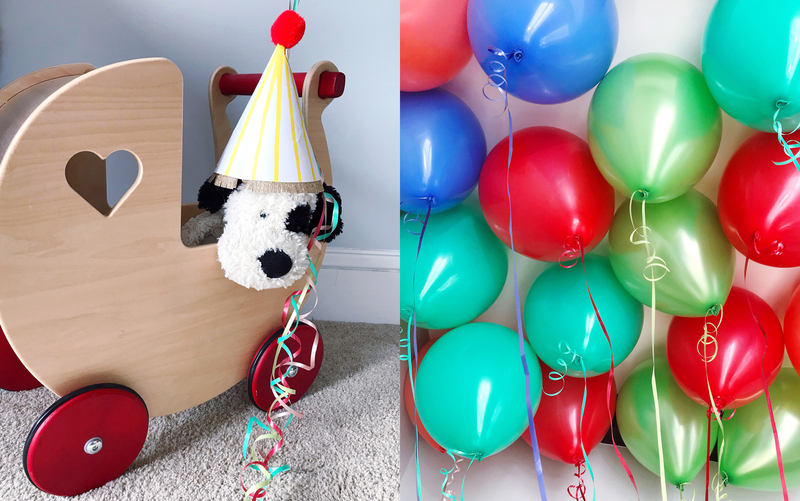 12 Responses to "Jane’s First Birthday Party." This is the cutest party! And it was fun to see your pretty sister in her dino costume! Jane is adorable! Aw thanks! We had fun! Dying!! This is so adorable–happy birthday, Jane! Also, talk about a drool-worthy menu! Your party for little Jane turned out amazing! We ❤️ girls who ❤️ Dinos! It was the very first theme party we created when we started Geese & Ganders! Congrats on a job well done! Everyone loved the cake topper, thank you so much! What an adorable party! I must know more about this homemade mac & cheese with bbq potato chips on top! 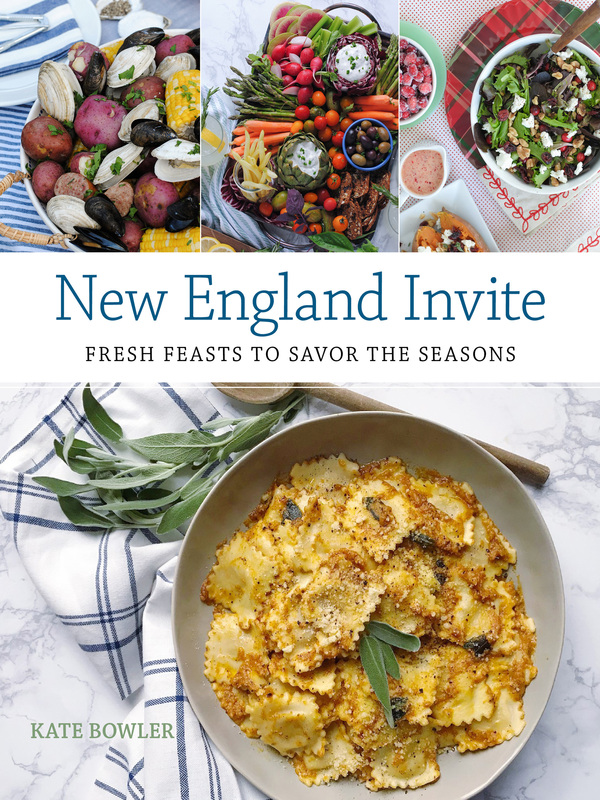 Would you please share this recipe? I’ll share the recipe this week! Happy Birthday Beanie!! We love you (and BBQ mac and cheese 🙂 🙂 🙂 )! I will be copying everything in a few months. Thank you!!!! Yay! I’ll send you the leftover party stuff if you want it!! What a sweet party for your girl! I love the menu, the theme, the decor! So adorable!